The garden is doing magnificent this year. Which, for a change, includes the pepper/chile patch. Our Big Jims and banana chiles are producing enough so I can pick four to five a week. Jalapeños, habanero and chipotles are coming along too. I roast them all then find something to make with them, or just eat them on the side with a dish. But yesterday, I am really snooping around the Big Jim plant and find three more trophy chiles. So, now I have a good amount to do something with…..it is hot, so slaving in the kitchen it not my idea of fun. Also, it seems like we are eating very late these days because of the heat and long sunny days. Trying to head outside in the evening to accomplish all the chores for the day while it is cooler. Then I cook. I think the system is a bit out of whack. Trying something new last night, I timed the dish to be prepped during the heat of the day, but put together an hour before eating and then eating when ever we came in. It worked. I found the dish stayed vary warm even after removing from the oven ( could be the 104 days we are having too), which made it perfect to remove, finish chores, come in and shower then eat. The dish is light, tasty and easy. Heat oven to 350. After chiles are roasted and peeled I divided them by pulling them apart. Almost like string cheese. Saving them on a plate or in a bowl for assembly. Cut the thigh meat into bit size hunks and set aside. Grate cheese. To assemble use a deep baking dish, grease or spray no stick for easier clean up. Put a handful of chips on the bottom, spread around so they are sort of even. Put 1/3 of cheese on chips. Then about half the chile pieces and half the thigh meat. Sprinkle another 1/3 cheese on top. Using the remainder of chile and chicken finish layering as even as possible. As always we hope you enjoy. Everyone is making baked veggies. Squash, califlower, greenbeans……yummy stuff. Some have strange dips or none at all. I tried this one last night with some baked zucchini chips and it was great. Mix everything together, cover and refrigerate a few hours. Very light with out salt so if your vegetable is salty it will balance it out well. Looks great yes? We have a fabulous garden this year. Six beautiful heads of cabbage are getting ready to form heads, but while they have a ways to go I am thinking about the giant outside leaves. There is no way the pioneers wasted these, but what did they do? 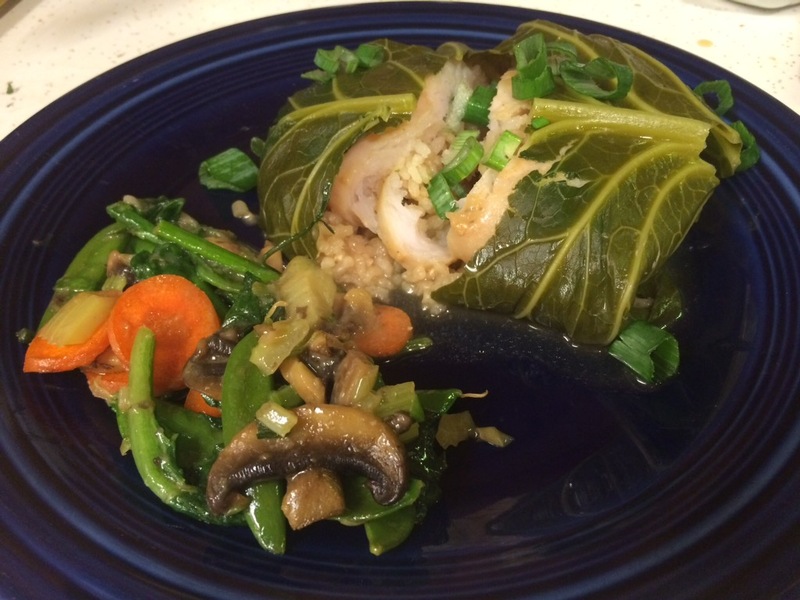 So I am thinking cabbage rolls….with some fish. In a since a meal in one type dish. We were very pleased with how this turned out. In a microwave safe bowl put rice, water and soy sauce. On high zap for 2 minutes, set aside. Wash cabbage leaves. In very large skillet put about 1/2-3/4 inch water. Heat water….does not have to boil. Place leaves one at a time in hot water, carefully flip over about 45 seconds each side. Just enough so leave bend easily. Put on a plate until all the leaves are done. Meanwhile, in a braising pan put some water in it to cook rolls. I used about 1/2 inch. Add chopped green onion to rice mixture and stir. Taking one leaf at a time remove the large stem area by cutting in a v shape. Do not cut the leaf in half. Only a few inches up, just so it rolls easier. 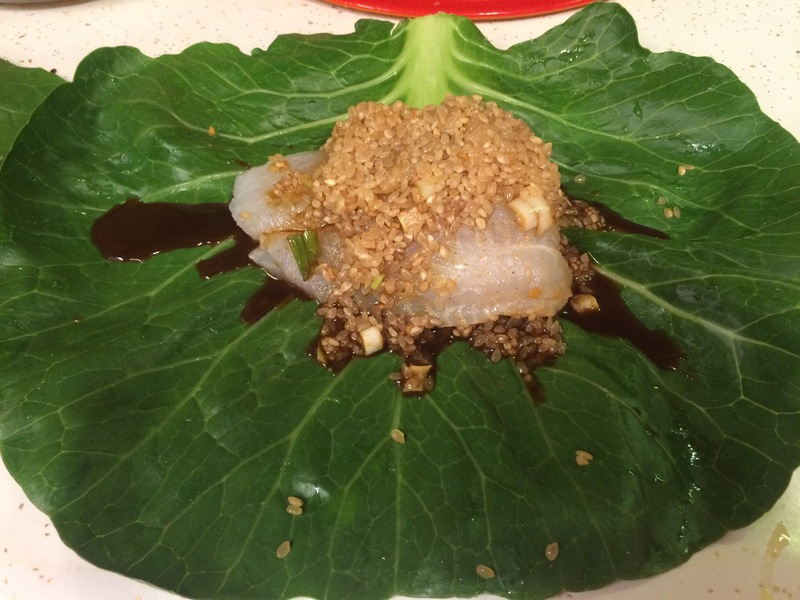 Using the inside of the cabbage place fish fillet, a scoop of rice mixture including some liquid. 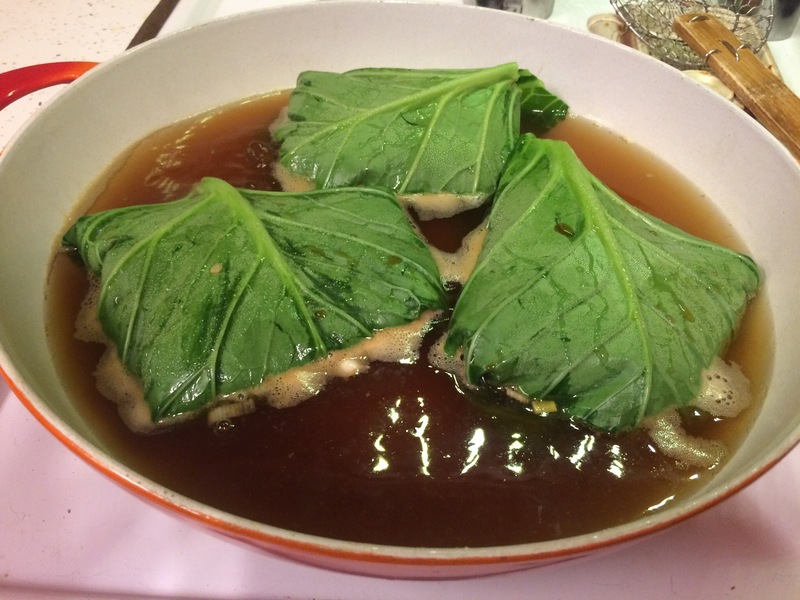 Roll sides in, top to bottom and tuck the remaining cabbage over, place in hot water of braising pan. Do this to each leaf. I did use up all the rice with the three leaves. Any liquid remaining in the bowl I pour into the pan to cook the rolls. Cover when done and cook medium heat for 40 minutes. This was a complete meal with great flavor. I’m in a Mexican flair mood. Tonight it is chicken and tomorrow venison. Tonight however, is a chicken we have marinated for months…….hahahaha….it was froze, perfect to thaw out and have ready after a hard day at work. The fruit juices, oregano, onions, garlic salt make a perfect blend for the chicken. After placing in a bag, let it freeze a bit, then seal. 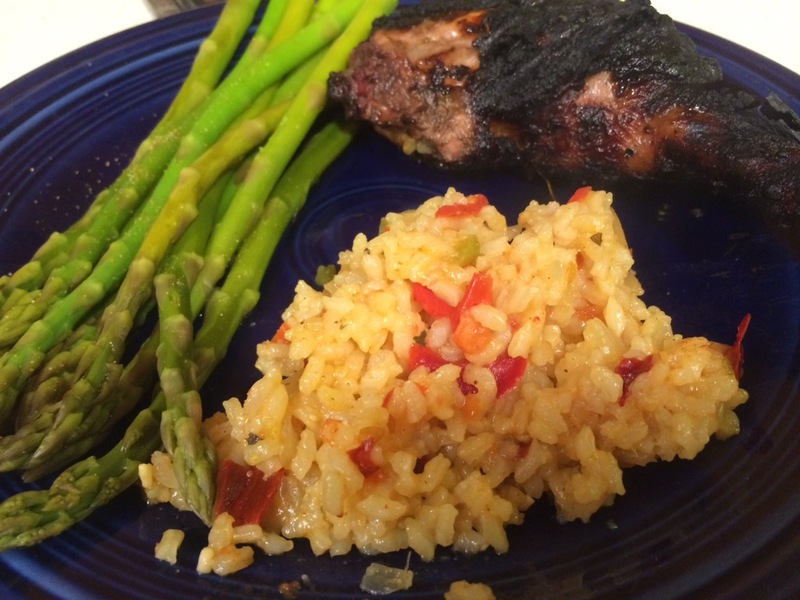 Saving for a later date…..usually great for camping, but tonight…….olé……and for this meal we are adding rice. A nice side dish to anything you would like to add a flare too. Colorful, tasty and easy. Heat a sauce pan, add oil when hot add all the veggies, even the guajillo pepper. Cook about five minutes. Add chicken broth, garlic salt and rice. Bring to a boil, stir a few times cover, then reduce heat and cook about 40 minutes on low until rice is done. Fluff with fork and serve. It is super bowl Sunday and I just came up with a blow your mind flavored dip. We are making stuffed potato skins, bacon, chives, green onions, cheese, salsa or ranch dressing. A sort of build your own skin, for the skin game. While making some salsas I wanted to do something with guajilloes, my favorite chili, and used this as a starter. This is chili recipe number one for today. sour cream in a container with a lid, mix 1/2 cup guajillo sauce into sour cream. Seal and refrigerate. This is so smooth and creamy, I am going to use it for chips as well as drizzle it on the stuffed potato skins. I really like pomeloes, but finding a “good” one can be difficult. They smell good, look good, however after slicing into them the pulp just is not quite right. And yes, this happened the other day. I hate to waste food. Having planned something chicken for dinner I decided to use the pulp for a marinade. It turned out pretty darn good. Of course some additives helped improve the flavor too. Remove pulp from pomelo, I cut chunks out placing them in a bowl and pressed down with a spoon to create some juice. After doing that add all the other ingrediants except chicken and stir. Put chicken in bag or bowl, pour everything on the chicken and massage a bit. Cover tightly or squish out the air, refrigerate over night or the day. Grill until done. I cooked the serranos on the grill as well. Very simple having a great flavor. I served it with roasted cauliflower. 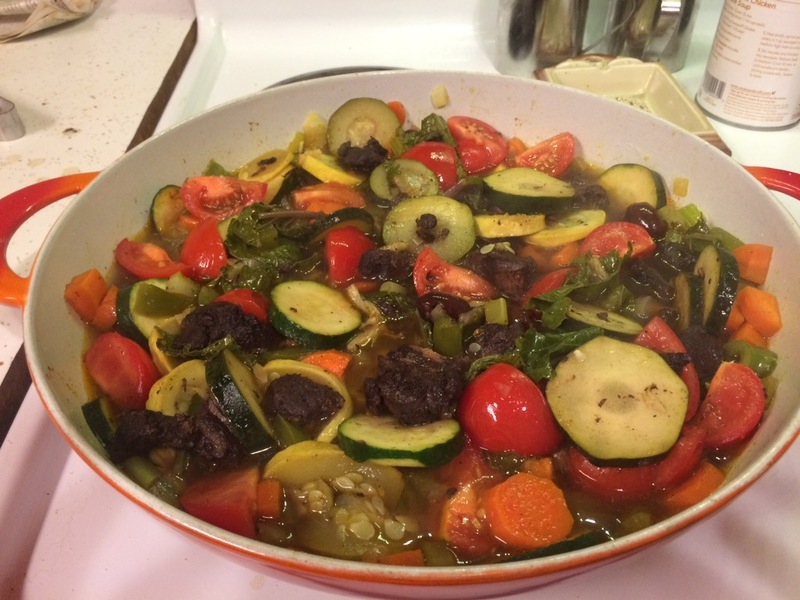 Yes, it has been awhile since I have published a recipe. True I have cooked, just forgotten to share with everyone. I have a couple of great ones too. It is not often I randomly shop without a purpose for a meal. The poblanos looked wonderful at the market so I was compelled to purchase two hoping to come up with a stuffing. Of course there is a time frame involved…., if I don’t come up with something fairly soon they will spoil and that is a waste. Planning meals ahead for the week is just something I do, trying to maximize potential left overs etc. Rotating what we have in the freezer is a priority too, things can get lost in there. So, I found some nice fish and decided on fish tacos, and an older bag of gulf shrimp, that really needed to be used. Now this old brain went to work and this is what I came up with. It has a wonderful sauce to go over it too. 2-4 poblanos roasted, peeled, plus you can gently cut the seed pod out. To prep before hand: To cook rice, boil one cup water add rice, stir. Reduce heat to low and cook 30 minutes, remove from heat and set aside. Roast peppers until dark brown-black, skin starts to peel away, (you can do this in the broiler section of your oven) place in a paper bag to sweat for ten minutes. Remove skin, gently make a slit to remove seeds, leave on stems then set aside. Peel shrimp and devein, remove their little tails too. You can place them on a plate or foil, sprinkle season salt and paprika on both sides. Cook on high heat: either in a grill type pan, or under the broiler or on the bbq until done, chop into thirds; Set aside. Shred the cheese, chop the serrano and cilantro, measure out 1/3 cup pineapple. At this point everything should be chopped, cooked and ready to assemble. Heat oven to 350 degrees. Lightly grease an 8×8 pan, or something similar. In a bowl dump cooked rice, pineapple, serrano, cilantro, cheese, tri pepper jelly, salt, shrimp and cheese. Toss to mix, if the rice is still warm the cheese will start to melt. No worries…. Next stuff each pepper with mixture, using all you have. I cooked only two poblanos having insides left over we saved them for later. 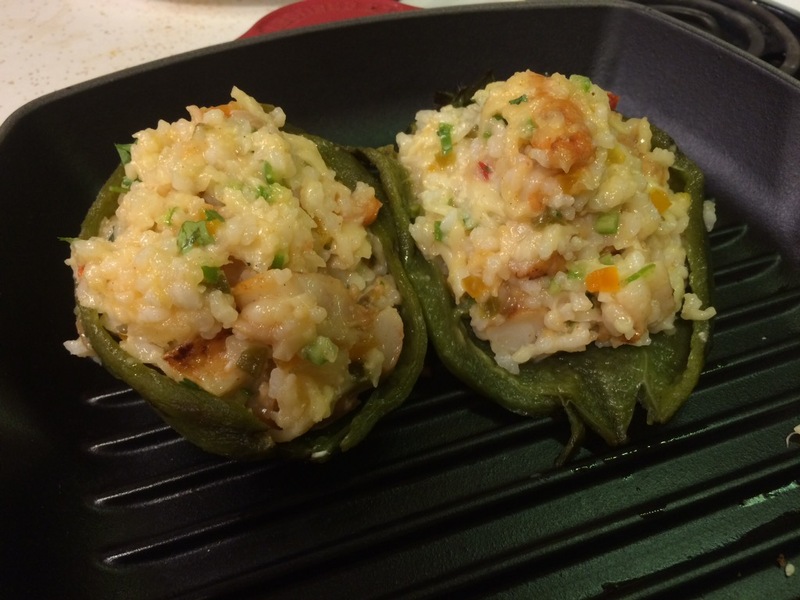 Place the stuffed peppers in a pan and bake for 40 minutes. While peppers are cooking clean and chop leek. In a shallow sauce pan heat butter and olive oil, add leeks, let cook until tender. Add flour and stir, pour in 1/2 and 1/2 and add pineapple. Heat until thickened. 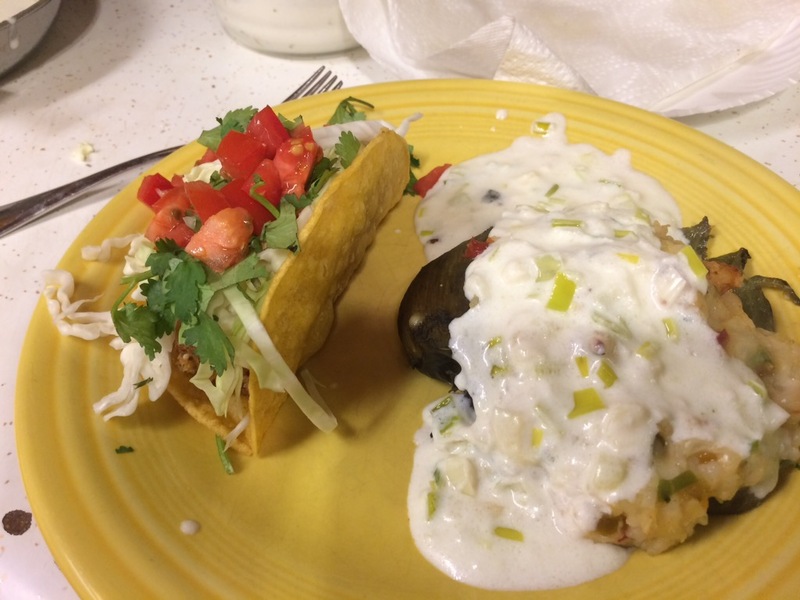 When poblanos are done place carefully on plate serving with the sauce over the top. This has a nice heat with the poblano and sweet with the tropical flavors. As always we hope you enjoy. Giving thanks to the Lord, our family and our friends. Be safe and be kind. If you follow my recipes at all you know I am always reinventing the wheel so to speak. 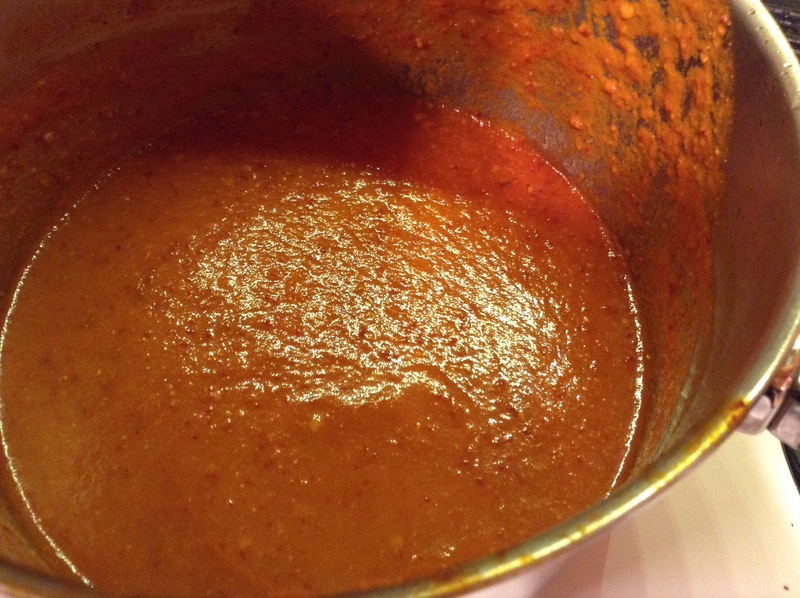 Again, I have altered an old recipe to make it even better…..I think anyway. Super easy and you probably already have this stuff on hand for Thanksgivings dinner. I am even thinking of making this throughout the year, it is light and full of flavor. 2 oranges cut out the pulp, no rind or skin: BUT save one sliver of rind. In a processor of your choice chop cranberries and orange pieces INCLUDING THE LITTLE RIND PIECE. Add sugar mix well. Place in a sauce pan and bring to a boil over medium high heat. Stir and boil 5-7 minutes. Remove from heat and let cool. In a large mixing bowl add chopped celery and apple then pinapple. Mix well. When the cranberry mixture is cool add to the celery and apples, mix again then put into your serving container, refrigerator over night. I am thinking you might get away with a cup of sugar but not sure if it will set up as well. You can add finely chopped walnuts if desired. As always enjoy……..and happy Thanksgiving to you all. I love spices and vegetables, but do not like to make the same thing over and over again. Usually I use only spinach and Moroccan seasoning. Today was a bit different. I had a refrigerator full of miscellaneous produce and needed to use them up. So this is what I came up with. Heat a shallow pan then add olive oil, onions, carrots and celery, bell pepper. Cook about 5 minutes, add garlic, salt, squashes and seasoning stir and place a lid on it for ten minutes. Add broth, stir in. Place tomatoes and kale on the top cover and cook ten more minutes. I added Klamata olives, I did not care for them too much in this dish. I also added some slow cooked venison which was awesome. You could add a protein to make it a complete dish. After cooking and once served up squeeze the lemon on top. I served this once with couscous and once with pre cook lasagna noodles sprinkled with parimisian cheese, olive oil and baked. Both where awesome.